In the MODEL statement, the response variable, Days, is crossed with the censoring variable, Status, with the value that indicates censoring is enclosed in parentheses. The values of Days are considered censored if the value of Status is 0; otherwise, they are considered event times. Graphics results are enabled through ODS Graphics with the specification of the ODS GRAPHICS ON statement. 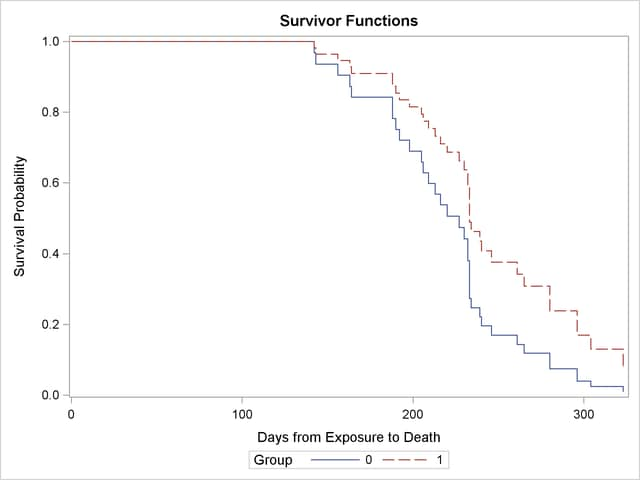 The survival curves for the two observations in the data set Regime, specified in the COVARIATES= option in the BASELINE statement, are requested through the PLOTS= option with the OVERLAY option for overlaying both survival curves in the same plot. Figure 64.2 shows a typical printed output of a classical analysis. Since Group takes only two values, the null hypothesis for no difference between the two groups is identical to the null hypothesis that the regression coefficient for Group is 0. All three tests in the "Testing Global Null Hypothesis: BETA=0" table (see the section Testing the Global Null Hypothesis) suggest that the survival curves for the two pretreatment groups might not be the same. In this model, the hazard ratio (or risk ratio) for Group, defined as the exponentiation of the regression coefficient for Group, is the ratio of the hazard functions between the two groups. The estimate is 0.551, implying that the hazard function for Group=1 is smaller than that for Group=0. In other words, rats in Group=1 lived longer than those in Group=0. This conclusion is also revealed in the plot of the survivor functions in Figure 64.2. The analysis of the parameter estimates is displayed in Figure 64.3. The Wald chi-square statistic for testing the null hypothesis that is 0.0158. The statistic is not statistically significant when compared to a chi-square distribution with one degree of freedom ( ). Thus, you can conclude that there is no evidence of an increasing or decreasing trend over time in the hazard ratio.